For you shutterbugs, Cannon would be definitely one of the best choices. However, to keep the large amount of Canon videos may perplex you to some extent. And you may be searching for the best way to keep the Cannon videos in DVD, then you should know how to convert Cannon videos to DVD at first and here comes the way. Since you could not store all videos just in the camera or computer, because they will occupy big space for storage, and they might be lost if the system is crashed or infected computer virus. 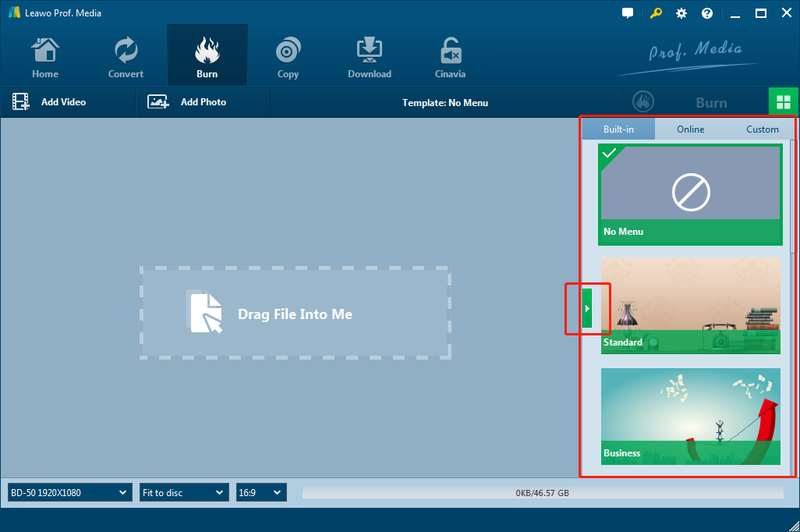 Additionally, to burn Canon Videos to DVD, you can not only save computer space but also keep it longer and make it easy to share. Due to these merits, Leawo DVD creator emerged and it is necessary for you to burn all Canon videos to DVD with this powerful tool. ☉ Supports burning 180+ types of videos and audio to DVD disc. Click the “Add Video” button to load Canon videos to the DVD creator or you can directly drag and drop Canon video files to the program. After the video files are imported, you could select subtitles and audio tracks, and play back the videos. Then you are able to set the output DVD disc type (DVD-5 or DVD-9), quality and aspect ratio (16:9 or 4:3) at the bottom. In the right sidebar, various preset disc menu templates in different themes is available for you to choose, such as Standard, Business, Education, Childhood, Holiday, etc. You can also DIY disc menu with your own images and audios if you like. When disc menu settings complete, click the big green “Burn” button to open the burning settings panel where you need to figure out Burn to, Disc Label, and Save to options. After the burning settings gets done, hit “Burn” button on the pop-up burning settings panel to start burning and the DVD Creator would immediately convert Canon videos to DVD in a few minutes. Finally, you got Canon videos to DVD and you can keep them safe for long, and if necessary, you can share them with your friends and family whenever you want. With this Canon videos to DVD converter, you can just feel free to enjoy your shooting with Canon and develop your skills since you can keep all of them and find out the footprints of you progress by burning Canon videos to DVD. 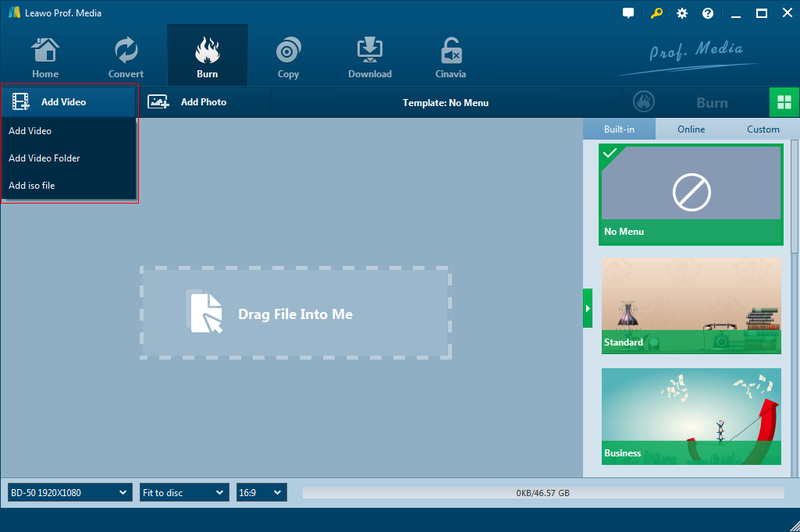 With Leawo DVD Creator, burning Canon videos to DVD would be just a piece of cake. Other than burning canon videos, it can also burn MP4 to DVD, or videos in other formats as you like. Free Video to DVD Burner is a clearly free program which is working peculiarly for burning videos to DVD. You can download and install it to run as Canon videos to DVD burner. It can work easily and every user can manage it as a piece of cake. Freemake video converter can convert video between over 500 formats and gadgets for free, including convert video to MP4, MP3, AVI, WMV, DVD, iPhone, Android. You can convert Canon videos to DVD with this tool easily and quickly. As a powerful free converter, it has 93 billion users. You can download this converter and freely burn Canon videos to DVD in simple steps. WinX DVD author is free software easy to use for even novice to burn all kinds of videos in formats like MP4, MKV, AVI, VOB, FLV, MOV, ISO and so on to DVD disc easily. Besides, home video DVD with personalized DVD menu, subtitle, and other elements can also be available with this software. To convert Canon videos to DVD, this software would be one of the best alternatives because it doesn’t set any limitations to make you create professional-looking DVD. In conclusion, there are many Canon videos to DVD burners which can be used for converting the Canon videos to DVD whenever you want. And these converters are easy to use so that even a novice can be an expert to converting and burning a DVD. Thus, you will never worry about keeping your beloved videos, feel free to enjoy Canon videos to DVD then.